Americans receive a daily barrage from the fake news media and climate “experts” reporting that each and every day, week, month or year is the hottest on record due to global warming. On Feb. 7, several major newspapers carried stories of the declaration by NASA and NOAA that the past five years have been the warmest on record. Sadly, these supposed experts use mathematical equations that do not jive with reality over the past 140 years. The same climate experts warn that record heat is just the tip of the iceberg. We are constantly told that global warming is the root cause behind any and all weather events that are extreme, destructive, unusual or uncomfortable. Many of these fear mongers also say we should stop burning fossil fuels that are causing this mayhem. Is the Earth truly experiencing the hottest weather on record? Absolutely not. After examining actual weather records over the past 100 years, there is no correlation between rising carbon dioxide levels and local temperatures. However, climate change alarmists always find somewhere on Earth where temperatures are hotter than ever. The focus is always on isolated temperatures that have reached all-time highs while ignoring reports of all-time record lows. These zealots would like you to believe that due to fossil fuel emissions, summers are now longer and hotter while winters are shorter and milder. 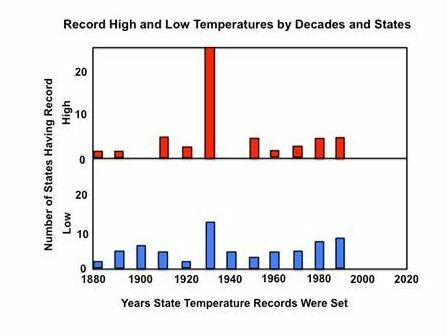 Yet, the actual temperature records tell a very different story. Did the Earth experience its hottest temperature ever this year? The answer is no. The highest record temperature ever reported was 136 degrees Fahrenheit in Libya in 1922. The record high temperature for the United States was 134 degrees Fahrenheit in Death Valley, California in 1913. Fossil fuel emissions in 1913 and 1922 were negligible compared to today. The coldest temperature ever reported was minus 129 degrees Fahrenheit in Vostok, Antarctica, in 1983 when Carbon dioxide emissions were five times higher than in 1913. The coldest temperature in the lower 48 states (excluding Alaska) of minus 64 degrees Fahrenheit was recorded in 1996 in Embarrass, Minnesota. 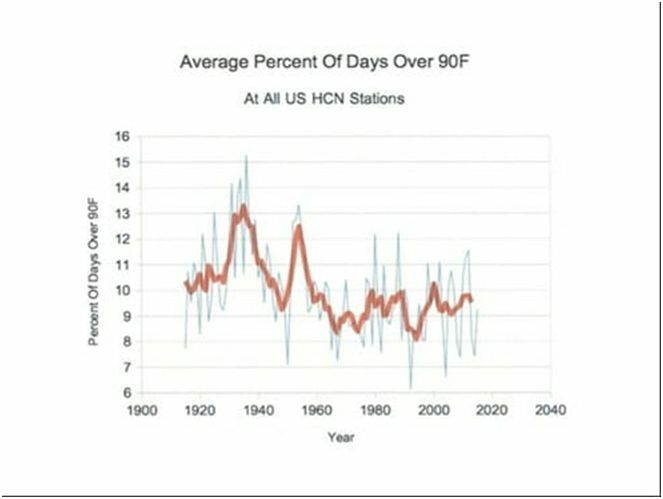 Did the media and climate scientists warn that this low temperature indicated that we are headed for another Ice Age? We hope these examples, right out of the weather record books, compiled by C.C. Burt in his book Extreme Weather Changes, will help you to understand the scams alarmists are trying to pull. These examples all illustrate that cherry-picking record high temperatures in isolated locations tells absolutely nothing about the Earth’s climate. The strongest heat wave ever recorded occurred in July 1936, generating high temperatures in half of America’s 50 states. In 1935, fossil fuel emissions were 25 times lower than today. America’s coldest year occurred in 1899, when temperatures dropped below 0 F in all 50 states. The heat waves experienced in the 1930s and 1950s are clearly evident here. Once again, the data does not support the claim that the United States is hotter than ever as a result of rising Carbon dioxide levels. Isn’t it time to start ignoring the calamitous annual claims that this is the hottest year on record? It just ain’t so. Jay Lehr (jlehr@heartland.org) is director of science at The Heartland Institute. Tom Harris (tom.harris@climatescienceinternational.net) is executive director of the International Climate Science Coalition).